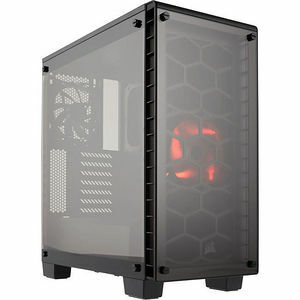 Beautifully simple and engineered to perform: the Crystal 460X has two-panel tempered glass, Direct Airflow cooling technology, is compact, expandable, and with one AF140L red LED and one AF120L fan, you can customize to your heart's content. We've engineered the Crystal 460X to pack all the performance and expandability you need into a beautifully modern and compact case design. Put your build on display through beautiful two-panel tempered glass and keep it all running cool and quiet with Direct Airflow technology. Clean up the inside of your case by placing cables and drives behind two modular, clean, and refined PSU and 3.5" bay covers. With tool-free drive installation and three-point dust filter access, the CORSAIR Crystal 460X is easy to build - and even easier to keep clean. You'll spend less time on setup and maintenance, and more time enjoying your PC.